Container Gardening Supplies: Here's the most important items you'll need to start your Container Garden... and be successful. In your Container Gardening Supplies, pots are available in many sizes, shapes, and materials. All containers, whether clay, wood, plastic, or ceramic, should have an adequate number of holes in the bottom for proper drainage. Additional holes should be drilled or punched in containers that do not drain quickly after each watering. Setting the container on a solid surface, such as a cement or patio floor, reduces drainage. Raising the container one or two inches off the floor by setting it on blocks of wood will solve this problem. The container's size will be determined by the plant selected. Generally, most plants grown in the soil can be grown in containers as long as ample space is provided for them to develop roots. Shallow-rooted crops like lettuce, peppers, radishes, herbs and most annuals need a container at least 6 inches in diameter with an 8-inch soil depth. Your container gardening supplies could also include, bushel baskets, half barrels, wooden tubs, or large pressed paper containers are ideal for growing tomatoes, squash, pole beans, cucumbers, and deep-rooted perennials. Rumford has created a little beauty here, as Amazon customers regularly attest to with glowing feedback. 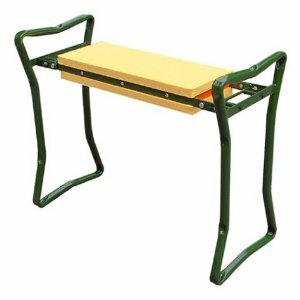 Good-looking and sturdy, when folded it can be used to protect your knees when you're planting or weeding, and in this shape it stores very easily. Strong enough to hold up the sturdiest gardener in chair mode. Container gardeners need to maximize their space, and this is a great way to do it. Highly recommended. When you're transferring seedlings to the garden, it can be hard to keep the worst of the weather -- and the rodents and other pests -- away from your precious little plants. 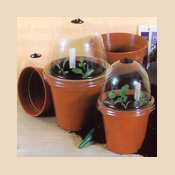 This smart solution is a simple plastic dome that sits over a 4" plant pot. Bell Boy plant protectors act like a mini greenhouse for emerging seeds and seedlings. 4" diameter x 3" high. These are very affordable, and made from recyclable plastic. A fairly lightweight mix is needed amongst your Container Gardening Supplies. Soil straight from the garden usually cannot be used in a container because it is too heavy, unless your garden has sandy loam or sandy soil. Clay soil consists of extremely small (microscopic) particles. In a container, the bad qualities of clay are exaggerated. It holds too much moisture when wet, resulting in too little air for the roots. Also, it pulls away from the sides of the pot when dry. Container medium must be porous in order to support plants, because roots require both air and water. Packaged potting soil available at local garden centers is relatively lightweight and may make a good container medium. For a large container garden, the expense of prepackaged or soilless mixes may be quite high. Try mixing your own with one part peat moss, one part garden loam, and one part clean coarse (builder's) sand, and a slow-release fertilizer (14-14-14) added according to container size. Lime may also be needed to bring the pH to around 6.5. In any case, a soil test is helpful in determining nutrient and pH needs, just as in a large garden. Who didn't want to be the Six Million Dollar Man in their youth? Though I doubt whether too many Steve Austin fans had fantasies about the perfect hand wear for pulling weeds. 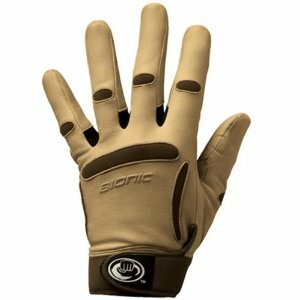 Calling anything "Bionic" really sets you up for a fall, but apparently these are the most highly-regarded gloves available today. You can easily spend $20 on a pair that lasts only a couple of years, so another $10 for a pair that should last a lifetime seems like a steal. Fertilize plants with the recommended rate of a water-soluble fertilizer every two to three weeks. 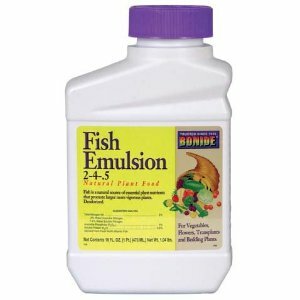 An occasional application of Bionide fish emulsion or compost will add trace elements to the soil. Do not add more than the recommended rate of any fertilizer. Doing so may cause fertilizer burn and kill your plants. Unlike garden plants, container plants do not have the buffer of large volumes of soil and humus to protect them from over-fertilizing or over-liming. 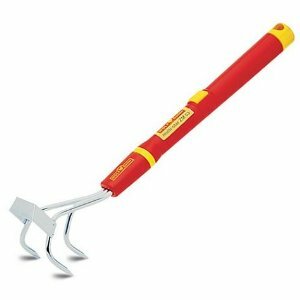 We absolutely LOVE the red and yellow Wolf Garden tools collection. The interchangeable handles mean you can switch to a short handle, for working in a window box or raised bed, then back to a longer handle for ground-level work. Wolf Garden has more than a dozen different tools suitable for box or container gardening, including rakes, hoes and cultivators. Read our in-depth reviews here. Pay particular attention to watering container plants. Because the volume of soil is relatively small, containers can dry out very quickly, especially if they are on a concrete patio in full sunlight. Daily or twice-daily watering may be necessary. Apply water until it runs out the drainage holes. Water clay pots and other porous containers more frequently, as they allow additional evaporation for the sides of the pots. Small pots also tend to dry out more quickly than larger ones. If the soil appears to be getting excessively dry (plants wilting every day is one sign), group the containers together so that the foliage creates a canopy to help shade the soil and keep it cool. Check containers at least once a day and twice on hot, dry, or windy days. Feel the soil to determine whether it is damp. Mulching and windbreaks can help reduce water requirements for containers. 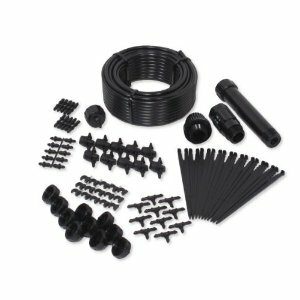 Consider installing an automatic trickle irrigation system if you plan to be away for extended periods. The amount of sunlight your container garden spot receives may determine which crops can be grown. Check light requirements for specific plants. Available light can be increased somewhat by providing reflective materials, such as aluminum foil, white-painted surfaces, and marble chips, around plants.